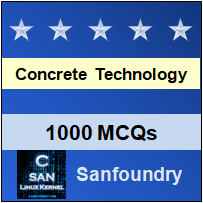 This set of Concrete Technology Multiple Choice Questions & Answers (MCQs) focuses on “HPC”. 1. It is ___________ strength and ___________ permeability. Explanation: It is specifically chosen so as to have particularly appropriate properties for the expected use of the structure such as high strength and low permeability. 2. “High Performance concrete works out to be economical”. Is it true or false? Explanation: High Performance concrete works out to be economical, even though its initial cost is high. 3. “HPC is not used in high span bridges”. Is it true or false? Explanation: Major applications of high-performance concrete in the field of Civil Engineering constructions have been in the areas of long-span bridges, high-rise buildings or structures, highway pavements, etc. 4. Concrete having 28- days’ compressive strength in the range of 60 to 100 MPa. Explanation: High Performance Concrete having 28- days’ compressive strength in the range of 60 to 100 MPa. 5. Concrete having 28-days compressive strength in the range of 100 to 150 MPa. Explanation: Very high performing Concrete having 28-days compressive strength in the range of 100 to 150 MPa. 6. High-Performance Concrete is ____________ as compared to Normal Strength Concrete. Explanation: High-Performance Concrete is more brittle as compared to Normal Strength Concrete (NSC), especially when high strength is the main criteria. 7. The choice of cement for high-strength concrete should not be based only on mortar-cube tests but it should also include tests of compressive strengths of concrete at ___________ days. Explanation: The choice of cement for high-strength concrete should not be based only on mortar-cube tests but it should also include tests of compressive strengths of concrete at 28, 56, and 91 days. 8. For high-strength concrete, a cement should produce a minimum 7-days mortar-cube strength of approximately ___ MPa. Explanation: For high-strength concrete, a cement should produce a minimum 7-days mortar-cube strength of approximately 30 MPa. 9. ____________ mm nominal maximum size aggregates gives optimum strength. Explanation: Many studies have found that 9.5 mm to 12.5 mm nominal maximum size aggregates gives optimum strength. Explanation: Due to low w/c ratio, it causes problems so superplasticizers are used.